The Joshua Tree. An album with an iconic front cover. Or actually, many front covers. We are going to look back at this album and the images that have graced the front of the album, from early prototype designs to the most recently announced additions for the 30th anniversary, due to be released in June. Last year we took a look at U2’s alternate covers. Among the covers we looked at were the three different photographs used on the cover of The Joshua Tree, but there is much more to the story than just those three photos. 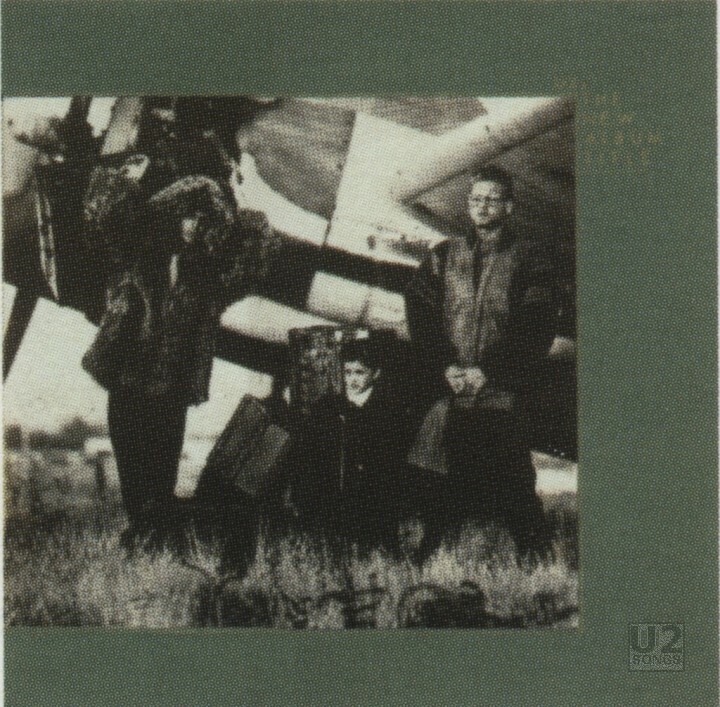 The liner notes for the original album list that photography was by Anton Corbijn, design and layout by Steve Averill and artwork by The Creative Dept., Ltd. The Creative Dept. was the name of the design firm that Steve Averill had started in 1983, and he used this name up until the release of The Joshua Tree. While working under that name, Averill was responsible for a number of covers, including Under a Blood Red Sky through to The Joshua Tree, several Virgin Prunes releases, singles by Gavin Friday and Cactus World News, among others. The name would become Works Associates in 1988, and later the more familiar Four5One, and is currently Amp Visual. Averill started design work on The Joshua Tree before the album had a name. In the early stages of the design work, the album featured a green border around three sides of a black and white image. The gold text was an early part of the design that carried through to the final design stages. In both cases of the earliest designs we have seen, the U2 is above the top right corner of the picture. To the right of that text and below it is a place holder for a future title which says “The New Album Title” with each word being on a separate line. There is a small square placeholder at the corner, between the “U2” and the “The”. And although difficult to see in the images, a line of gold goes around the photo. There is also a horizontal line under “Title”. The first image shows a rusted out truck body in the desert with some hills in the background, and a small patch of brush behind the truck. The second image also appears to be a desert landscape, showing an old plane, with three unknown people in front of it, as well as several large items of luggage. One of the people appears to be a child. As the album gained a name, and the design progressed, the green border was left behind in favor of a white border with the silhouette of the tree we have come to know as such a part of the overall album. 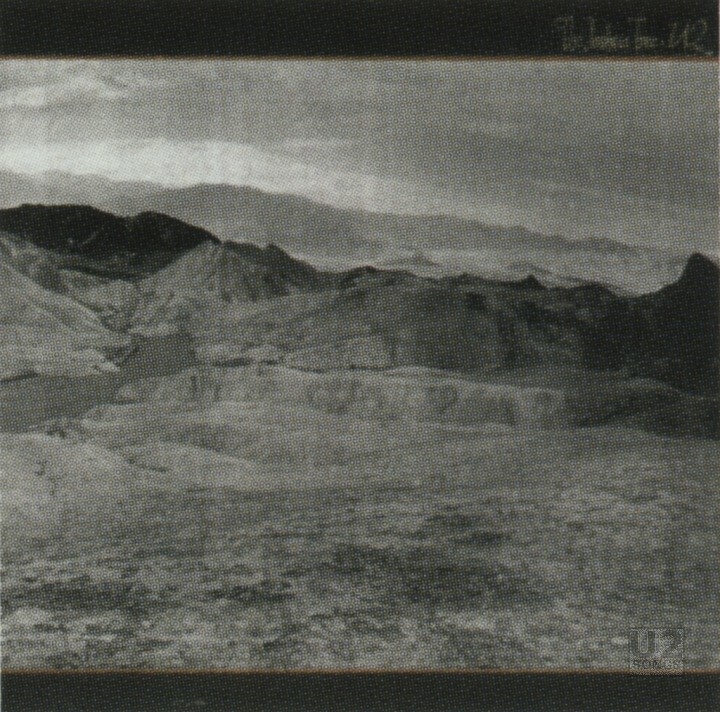 The cover featured a shot from Zabriskie Point in Death Valley in black and white, surrounded on three sides by the white area. 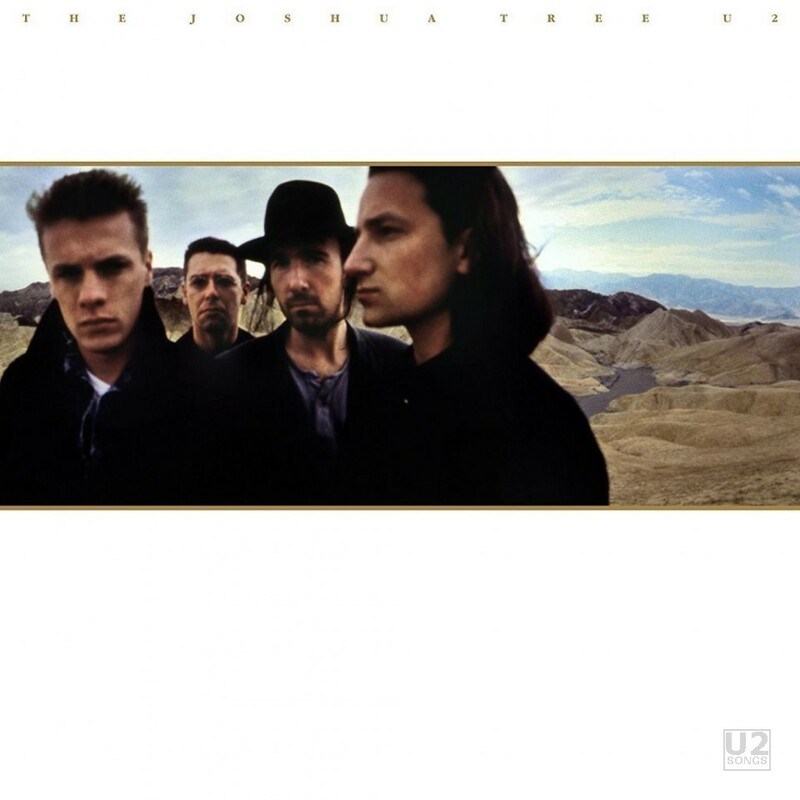 “U2” is above the image at the top right corner, and The Joshua Tree is below the picture. Both are in grey text. The next iteration of the cover takes the same shot from Zabriskie Point as on the previous cover, and spreads it across the image. The album now has the well known black bars above and below the image, and a thin gold border along both sides of the image. 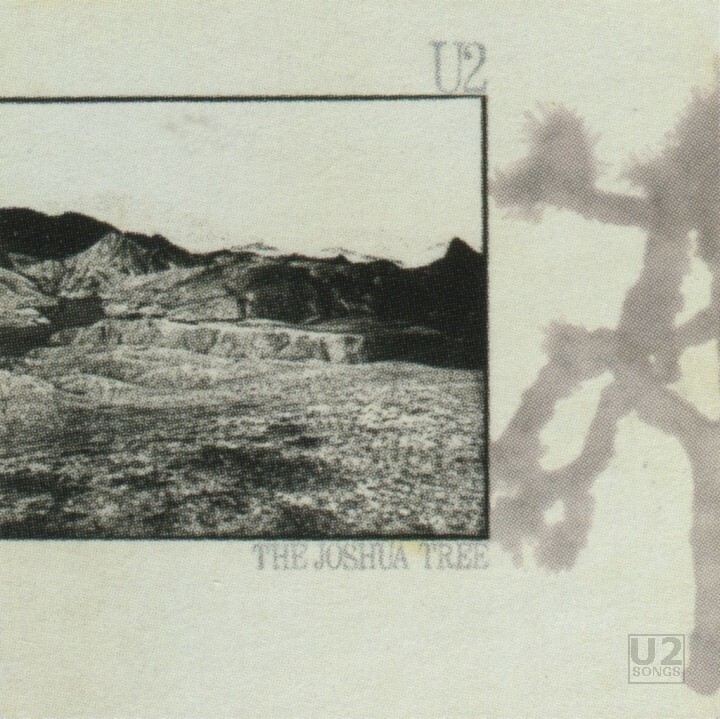 In this case all of the text is above the photo, in what appears to be handwriting that says “The Joshua Tree U2”. The idea in this cover is that the album, a gate fold, wrap around image, would show this image of Zabriskie Point on the front and you would see the band only on the back side of the cover. That cinematic shot was the one used in that last landscape only prototype image seen above. 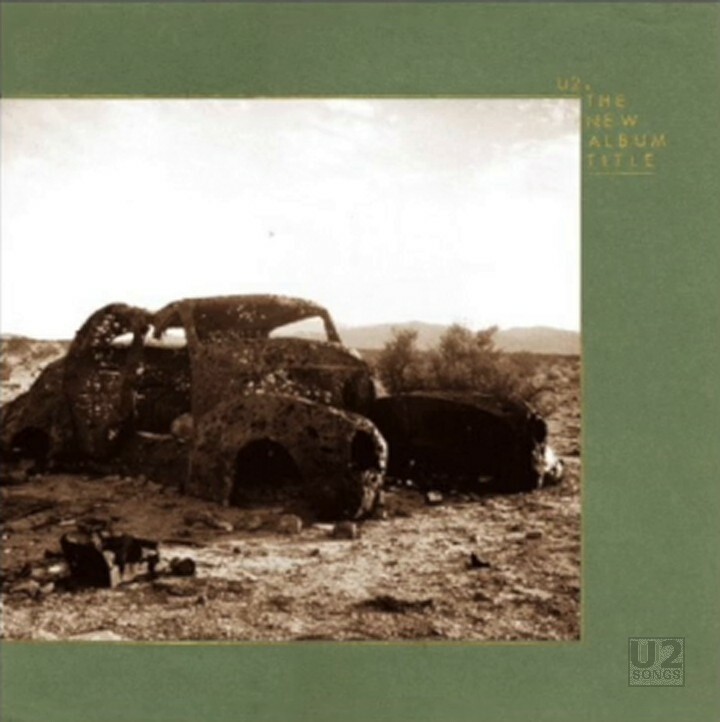 For the final cover Averill shifted U2 so that they were in the left side of the image, and the landscape of Zabriskie Point could be seen on the right. This widescreen image increased the size of the bars above and below the image, and this is the image that many people think of when they think of the album. 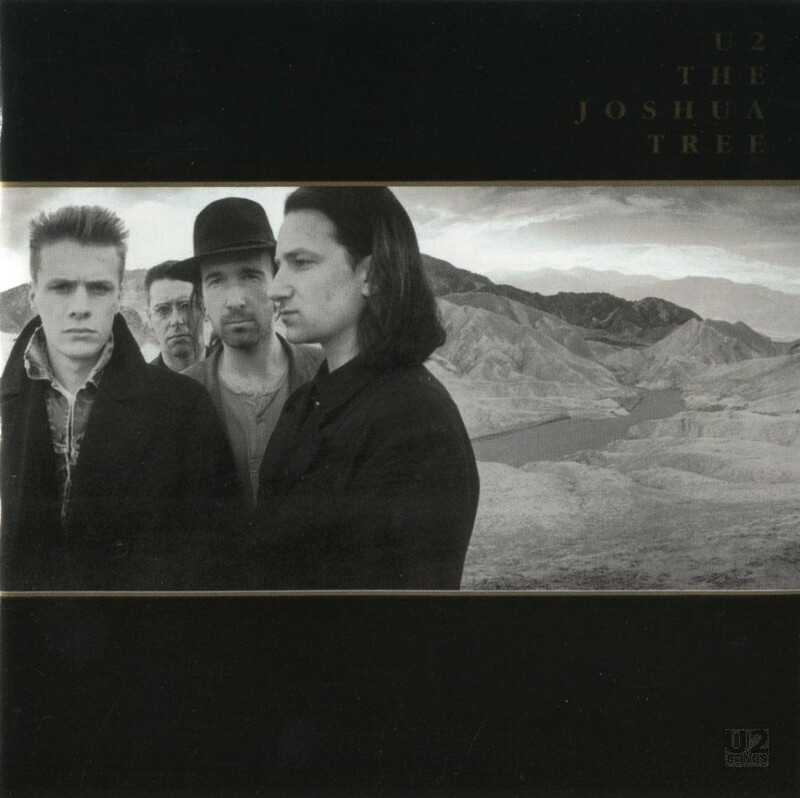 In that image Larry is looking direct at the camera, Bono and Edge overlap only slightly, and the horizon of the rocks in Zabriskie point is just below the level of the bands heads. 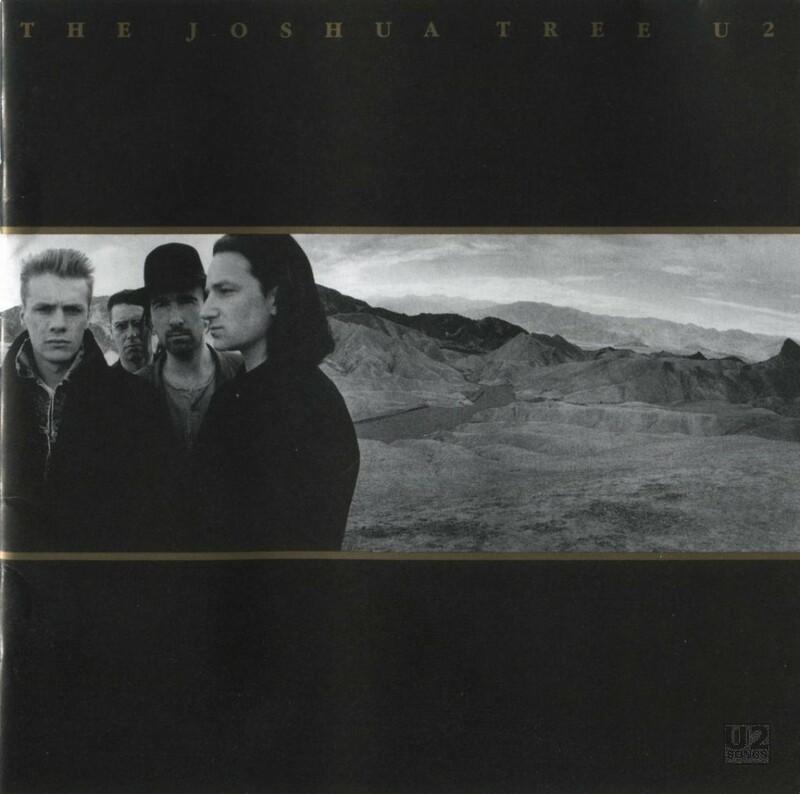 The design has “THE JOSHUA TREE U2” in one continuous line above the image, and the image of the band is just slightly less than half of the total image seen. This was used for the original pressings on vinyl, and was also used for the 2007 versions on vinyl. The photograph used on the cassette in most regions is a different shot taken from a different angle. In the cassette image the hills behind the band are well over their heads, while in the photo used for the vinyl the hills are below. Also instead of looking towards the camera, Larry is now looking to the left. 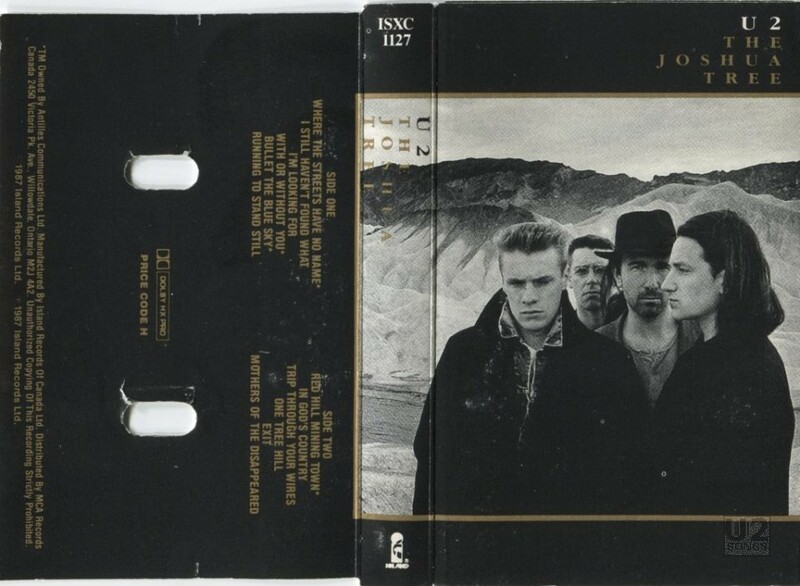 And Bono is closer to covering the Edge’s face in the cassette cover. Unlike the vinyl the text on the cassette falls in the top right of the cover, with each line of the title being on a separate line. 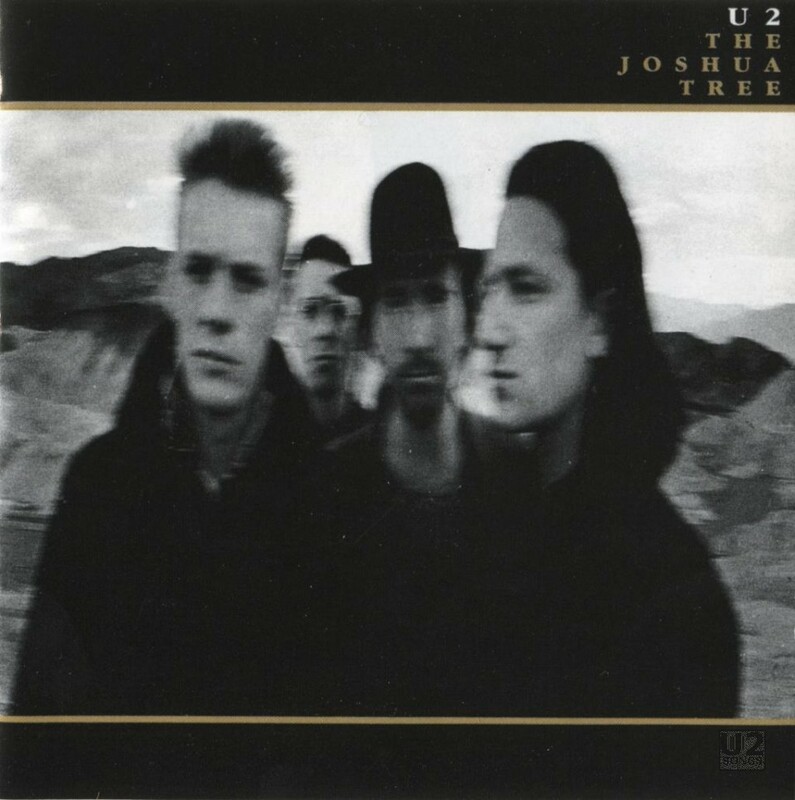 The title of the album is in gold, and the U2 above it is in white. In a few areas, such as Argentina, the same photo as the vinyl was used, in alternate configurations, however this alternate photograph was most commonly used. The same image was used for the 8-Track that was issued through a record club in the USA. The 8-Track at the time had faded as a format and The Joshua Tree was never released in stores in that format. But Columbia House maintained a record club up until 1989 issuing 8-Track cassettes, and The Joshua Tree was made available in that format. It was one of four U2 8-Tracks made available. Rattle and Hum, The Unforgettable Fire and Wide Awake in America were all released in the same format. The 8-Track artwork adds a unique blue border around the cover image. Its a design element probably added in house at the record club. In late 1992, a new format was introduced by Philips, called the Digital Compact Cassette. 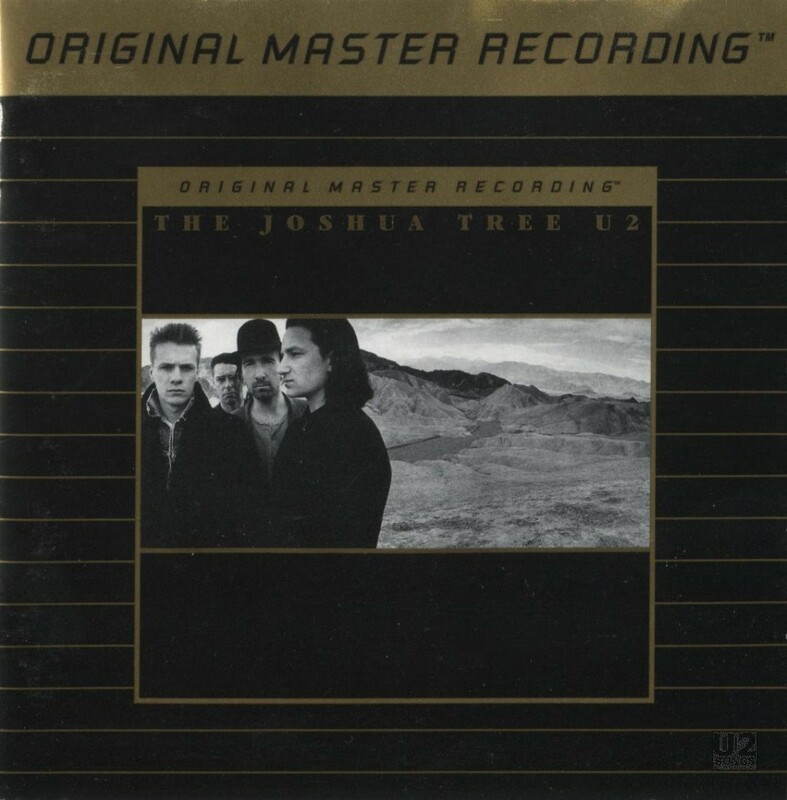 That format saw The Joshua Tree released and it too use the cassette image for its artwork instead of going with the more familiar alternates. 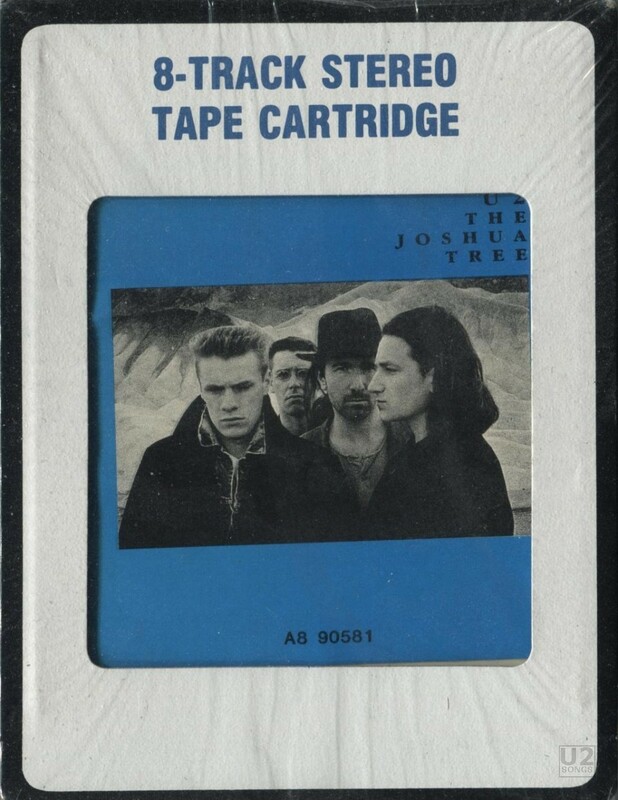 Due to the way the booklet is packaged the title and the “U2” are moved further to the left for this release so that the entire title can be seen through the front of the cassette case. The ugliest version of the original cover in my opinion was that of the compact disc. This used a closer shot of the band, who are quite blurred. 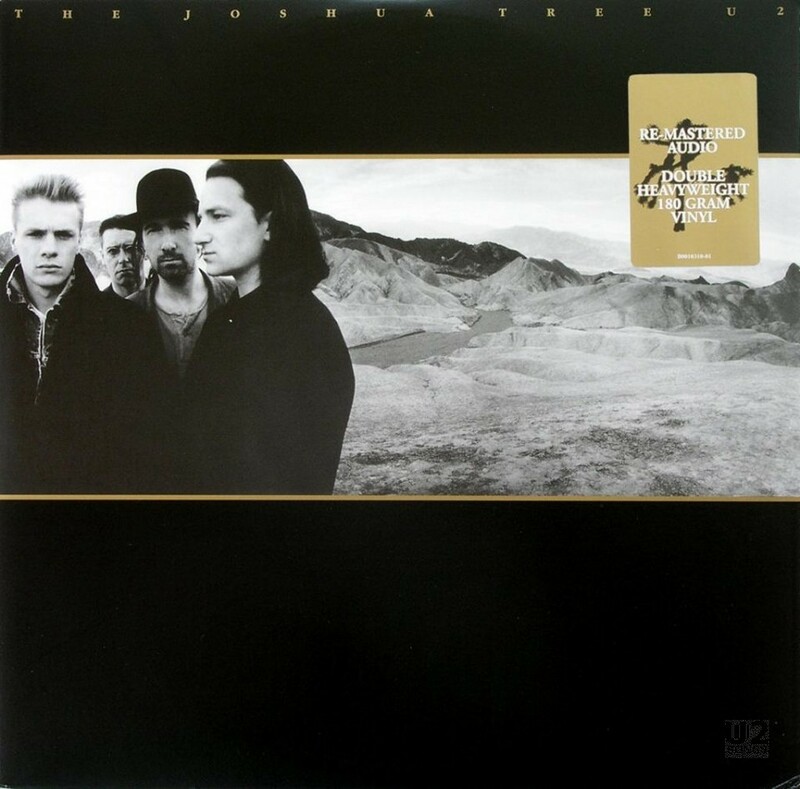 Bono barely overlaps with The Edge, Larry looks more towards the cover, and the ridge behind the band is at a similar location or slightly to where it sits on the vinyl cover. The cover takes away most of the location behind the band and is far more focused on the band, although quite a blurry image of them. The text is on the top right hand side, and each word in the title finds itself on its own line. The first release on CD to use an alternate cover was the 1997 pressing by Mobile Fidelity on gold disc. This remaster of the album was released in the house sleeve used by all Mobile Fidelity recordings. And for the first time on any pressing on CD, in the center of the Mobile Fidelity cover they used the image from the LP instead of that from the CD. And like the vinyl pressing, the titles are spread across the top of the entire image, instead of being bunched to the right. 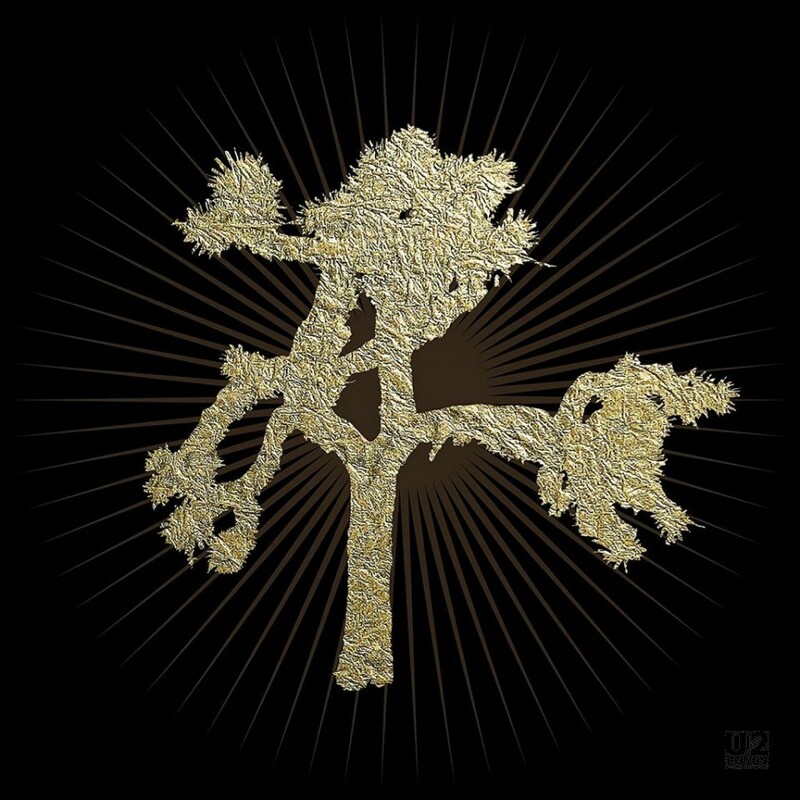 In 1999, as mentioned above, The Joshua Tree was repressed in Europe, and at that point they went back to the original vinyl image. The image used was the one from the vinyl pressing, however it is cropped so that less of the landscape can be seen, and the band are closer to the viewer. This re-release continued to stack the title on multiple lines like the earlier CD release. This cover was only available in Europe, In most countries in North and South America, Australia, Japan and many others the blurred cover was continued in use until 2007. However there were a few exceptions, Mexico for instance did issue the CD with the same new cover used in Europe. In 2007, the whole album was remastered by The Edge for release on the 20th anniversary. At that time the cover was also updated again. And for the first time, 20 years later, the cover of the CD looks very similar to the original vinyl pressing. The text with the title and name of the band are across the top. The image is the same image used on the original vinyl, at a similar aspect. And the packaging was used on the CD, the box set, and the vinyl album released at that time. 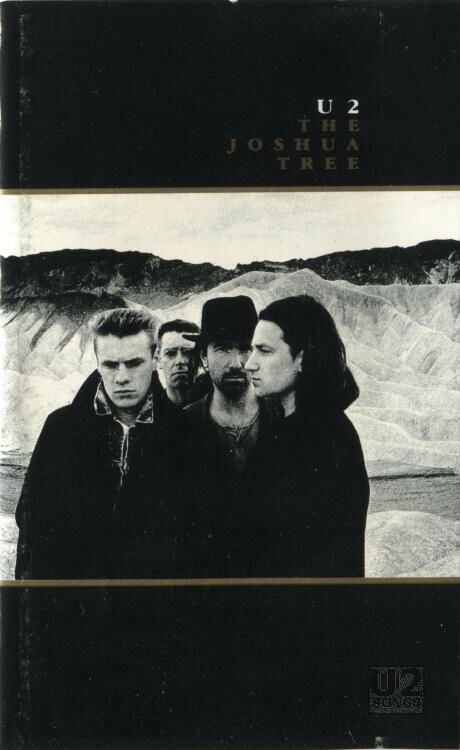 Now this year we are getting a new edition of The Joshua Tree for the album’s 30th anniversary. Shaughn McGrath has gone back to the archives of the original photo shoot, and has found a colour image of U2 from the same photo shoot which gave us the original three images. And this time instead of black and white, the photo is being kept in colour, and instead of framing it with black, the image will be framed with white borders. This is the version of the cover that will be used on the 2-CD set. For the box set a different approach has been taken, and that goes back to the original tree. Here the tree is done in gold foil on the box, with a sunburst pattern printed behind it. This will be used on both the vinyl and the CD box sets, and both will be a large box at approximately a foot in length and width. Inside the box the colour image with the white borders appears to be used for one of the sleeves which will hold the CDs. For more information about the cover of the album, and the design process, the RTE site has a recent interview with Steve Averill discussing the album cover that they published earlier this month. Some images from this article were taken from the book, Stealing Hearts at a Traveling Show: The Graphic Design of U2 by Four5One, and the remainder are from the collection of U2Songs.Com.